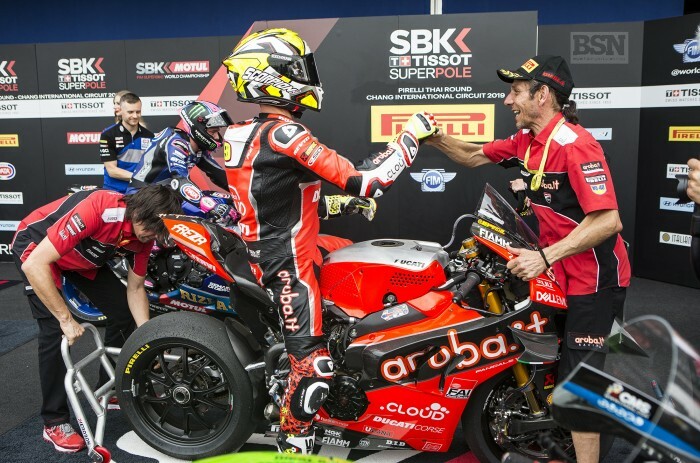 Alvaro Bautista has won all four WorldSBK races this season so far, but his latest was a different from his seemingly three easy pieces in Australia – even if he still led Jonathan Rea over the line by eight seconds after 20 laps of Buriram. Rea had slowed up after two-thirds distance, after Bautista set a new lap record on lap nine (a 1’32.724) to ease away after some hard battles and catch-up with Rea after a dramatic clash. Rea had passed Bautista inside at the double apex slow rights, early in the race, and as they headed for the second apex they hit, hard, enough for Bautista to have to make an impressive save and leave him with rubber marks all down the right leg of his leathers. Bautista was less than pleased with Rea. “In that corner normally the line we make like we brake hard, then go a bit wide, and then prepare the exit form the corner,” he said. Aggressive. Very aggressive. You have to ask him if he wanted to do an inside line or make like motocross style block pass – Paah! Bang! There are two points of view. Rea had made a very early turn one move on holeshot man Bautista, a first time Superpole winner (and new track best record holder with a 1’31.912). But this pass was not contentious for him. “In the first corner I braked too late and exiting from the corner I lost a lot,” said Bautista, and then explained why he had Rea had such an engaging race - for at least 60 per cent of it. “In the afternoon, I do not know why, my feeling with the bike was not like in the morning. “I struggled a lot to stop the bike in the braking area and then I lost braking, but also exit speed because the line was not perfect to accelerate and I think our strong point is acceleration and I cannot use it during the race. “So I was, all race long, not riding comfortably. For me it has been not an easy race – not for the fight with Johnny – more for my feeling with the bike. I did not feel comfortable. My bike was moving a bit today because it was difficult to keep the line. Bautista’s comeback to win his fourth WorldSBK race in succession did not appear to be a sure thing for a time. “When I passed Alex I saw that Jonathan’s pace was very similar to mine,” said Bautista. “After three or four laps I started to go faster and faster and I thought, ‘OK, maybe I can catch him.’ He stayed some laps behind me but then he had to slow down. I was at the limit with the bike. If the feeling was good with the bike I would be able to go a bit faster. Bautista was asked if he would be unbeatable on Sunday, if he found his happy bike setting again, but he was firm in his reply.